Preheat oven to 160°C (325°F). Place the figs and water in a medium saucepan over high heat and cook, stirring occasionally, for 15 minutes or until soft. Remove from the heat, add the bicarbonate of soda and stir to combine. Set aside for 10 minutes. Using a hand-held blender, blend until smooth. Place the eggs and sugar in the bowl of an electric mixer and whisk for 8 minutes or until thick and tripled in volume. Add the fig puree, flour, almond meal, vanilla and oil and gently fold to combine. Pour into a lightly greased 22cm round cake tin lined with non-stick baking paper. To make the caramel sauce, place the sugar and coconut milk in a medium saucepan over high heat. Bring to the boil and cook for 5–8 minutes or until slightly thickened. the sugar starts to melt. Add the figs, cut-side down, and cook for 1–2 minutes or until golden. 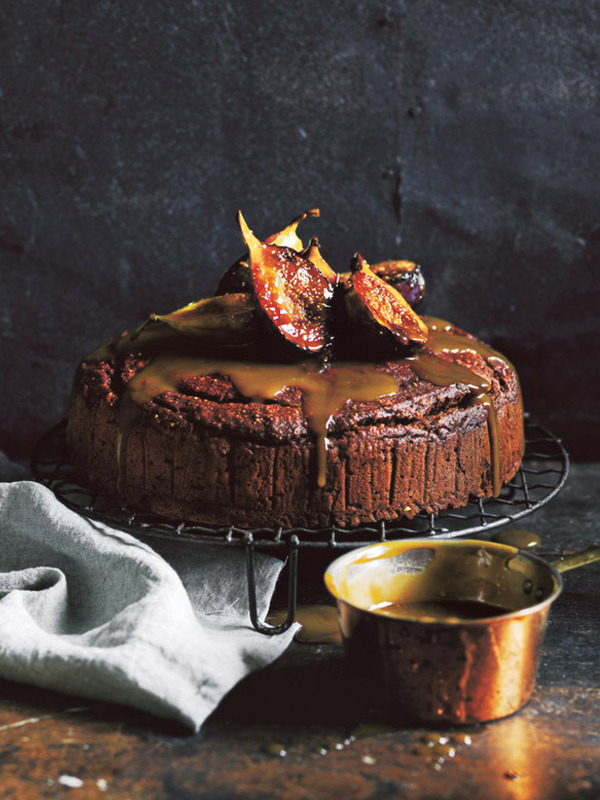 Top the warm cake with the caramel sauce and caramelised figs to serve. Serves 8–10. Hi Nikki, you should use a soft and dry fig. Yes, it is roughly the same size. The DH Team. does it matter what type of dried fig? also is 22cm cake pan the same as a 9in one?